A few nights ago, I tweeted that I might have to curtail the blog due to the husband's displeasure at my cooking antics. If you're a regular reader, you'll know we don't live in a world of champagne and roses (who does?) and much as we love her, like many older first time parents, things have been strained since Miss A appeared in our world. The 'rents came to take Miss A out today for a birthday trip to Longleat, with the added bonus of giving me and the husband some time to ourselves. It's been about six months since we were last in this situation. Of course, things didn't go to plan and after a few toys were thrown out of prams, we got on to having a discussion about why the husband gets so fed up with me and my blog. Apparently it's because we don't spend much time together and he doesn't like that some nights, I'm still cooking my tea when he's finished his. I countered the argument with the evidence that he starts whining at about 6.30pm that he's hungry. At this point, I still have around an hour of Miss A's bedtime routine to complete so sometimes, it's just easier to cook his dinner first to keep him quiet and then do mine and the lunchboxes for the following day at my leisure. I didn't realise he valued my company at the dinner table so much - especially because (as he will readily admit) he's normally glued to the Premiership/Championship/Champions League/Europa League/FA Cup/Carling Cup/La Liga/Serie A/Bundes League.... at tea time. It's now been agreed that if I tell him that I won't be eating with him, and that I don't get in the way of him loading the dishwasher or making coffee when he's finished dinner then it's okay for me to continue. I can live with that - if he doesn't mind me interrupting the football to impart this information. Unity restored, we went out for a late lunch and ended up pottering around the local vintage shop. The husband is a photographer and one of his offerings is Vintage Pinup-style photography so we are always on the look out for fun props and items of clothing. Because I have an hourglass figure, I love fifties style fitted shift dresses but I'm never brave enough to wear anything too extravagant. However today, I found a big, floppy seventies hat in my favourite colour which perfectly matches my favourite Mary Janes and compliments my seventies-style winter coat. I just had to have it. Even though it's a winter hat and it was a little to warm for it, I decided in my wisdom to wear my new purchase for the rest of our outing. I got a few odd looks. 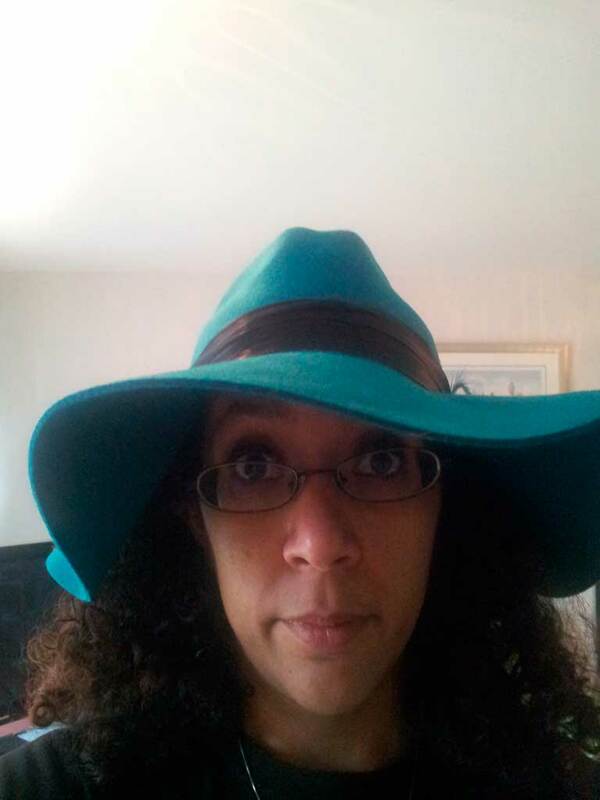 Being as self-conscious as I am, I wasn't sure if these were looks of amusement or admiration but I kept on wearing the hat because the husband said it suited me. I got home and decided to tweet a picture of my fab new find. And then I realised what all those looks were in aid of. I looked like a bloody leprechaun. On St Patrick's Day. I mentioned this to the husband and he nearly died laughing. Trust me, at the moment, it takes a lot to provoke his lips to even curl in an upwards direction and the level of belly-laughing that emanated from him made it quite clear that he'd realised this while we were out and was amusing himself by letting me wear it. And so there ended my plan to further celebrate St Paddy's day with an Irish recipe. 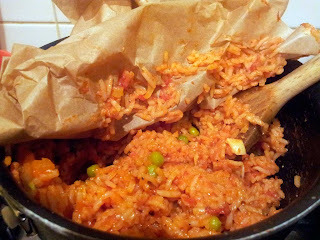 Instead, I decided we'd have fajitas for tea and I'd have a go at making Ms Miers' tomato rice. The husband normally has a pack of Uncle Ben's tomato rice with his and I've been looking for a good recipe to replace his reliance on packaged food for ages. This seemed to fit the bill. 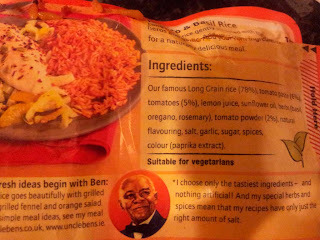 I don't have anything against the ingredients in Uncle Ben's per se as there are supposedly no nasty additives. It's just blooming expensive for a bit of rice. The cost can be anywhere from £1.39 up to about £1.99 (ignoring the supermarket offers). One packet is supposed to serve two. The husband eats one to himself. I'm sure Miers' recipe cost about £1 for four generous portions. Best of all, you can make it in advance and keep it warm in the oven for a couple of hours. This meant I could cook it whilst Miss A was still up and we could both eat together once she was in bed. Overall it was a really simple recipe and had good flavours. At first, I couldn't really sense the chilli but by the end, you knew it was there and I was gulping water like a camel at an oasis. I do think it might have been better with long grain rice as it was a little stodgy for my liking - or maybe I just cooked it a bit too long. I was also disappointed with the instruction that it would keep warm in a low oven for up to two hours. An hour in, I took it out to serve and it was barely lukewarm. Obviously not wanting to disappear back to the kitchen whilst the husband ate alone, I ate it as was. Next time, I'd possibly only leave it for the minimum ten minutes or blast it in the microwave for a minute before serving. As I can't find the recipe online, you'll just have to go buy a copy of Mexican Food Made Simple published by Hodder Trust me, you won't regret it!